Design and Theories of Things. Symposium Design History Society. Co-organized with Leslie Atzmon Eastern Michigan University. What do theories of things mean, to, for, and in design in both their historical and contemporary contexts? This one-day symposium is is based on, and expands upon, the material collected in the volume Encountering Things. Design and Theories of Things by Leslie Atzmon and Prasad Boradkar (eds.) (London, Bloomsbury, 2017). 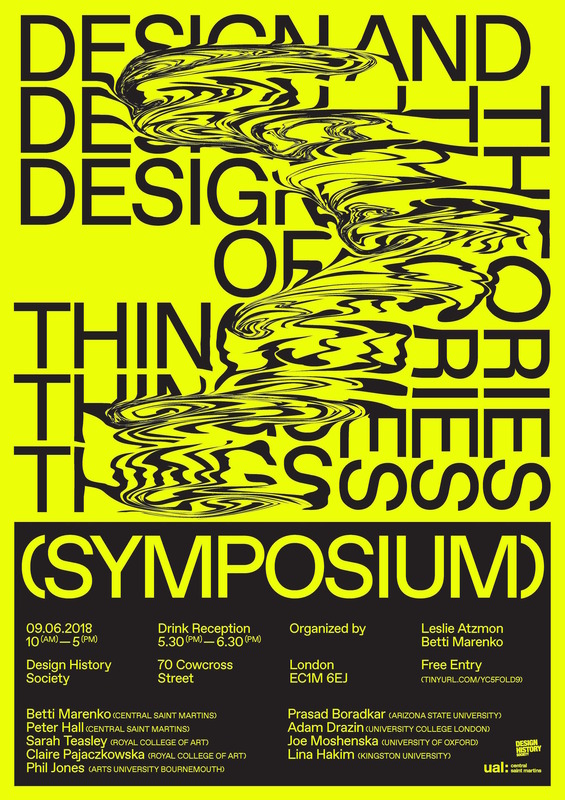 The symposium brings together design theorists, historians and practitioners to examine and debate how designed objects are located in a larger nexus of theories of things. Panel and respondents’ presentations–which are varied and rich in case-studies–show how theory is relevant to those who are interested in the processes through which designed things come into being, and the ways that designed things and objects resonate with those who use them. The presentations offer insights into how things and objects are the central, inevitable media of design, and how design is, therefore, particularly consequential to the ways that things and objects fashion the world around us. Filled with Wonder: Enchanting Androids from Cams to Codes (historical, 18th c.) Marenko compares eighteenth-century automata and contemporary Android devices–both actors in what she describes as an imaginative material genealogy of technology. Whether they are mechanical or digital, Marenko argues, these devices provoke questions about both the artificiality of life and the intelligence of machines. For Marenko, mechanical and digital devices juxtapose the intellectual capabilities of machines against the artificial nature of human life. The Graphic Thing: Ambiguity, Dysfunction, and Excess in Designed Objects (historical, late 20th c.) In this presentation, Jones focuses on how design artefacts enable human thought and action. He interprets Brown’s definition of things and objects through the lens of George Lakoff and Mark Johnson’s “embodied realism,” in which our bodies mediate the production of meaning. Jones presents examples that flesh out his ideas, including Paul Elliman’s typeface Bits, Mervyn Kurlansky’s Krazy Kaps, Stephen Johnson’s undergraduate project on emergence, Richard Olsen’s book Double Bind, and Muji objects. The Hole as the Thing: Ripped Knee Jeans 2017-8 In this presentation, which is about the current fashion for slit, torn, cut, or abraded ripped-knee jeans, Pajaczkowska discusses the functions of denim as a material and jeans as a thing that signify ‘wear’ and experience. This fashion invites design historians to conceptualise hyper-sociality as an object of both desire and knowledge. This presentation suggests that Darwin’s theory of Sexual Selection may help the methodological predicament. Agency and Counteragency of Materials: A Story of Copper in India (historical, last hundred years) Boradkar considers the craftspeople of tambat ali near Pune, India, who over several generations have been fabricating copper coins, vessels, and religious statues from copper. Using hand tools and powered machines, the craftspeople exercise their creative agency on the copper to shape it into beautiful and useful things, while the material responds with a counter-agency that partially resists their efforts. Boradkar presents a visual and verbal exposition of the agency and counter-agency of copper through the biography of one unique vessel, a water carafe. Policy as Designed Artefact: A Social Life of Things Approach (historical, 20th c.) Teasley’s paper analyses government policy as a design artefact, taking a social life of things approach. Her case study addresses an element of twentieth-century Japan’s industrial policy, designed to stimulate and support economic development in non-industrialised regions through design advising. Through this case study, the paper addresses methodological questions about understanding complex intangible artefacts such as policy within design history frameworks, and the opportunities and challenges provided by a social life of things approach. Things in Design Anthropology There has been a distinct ‘turn to the future’ in recent design anthropology. This turn is often characterised by work in which certain objects and things are understood as presencing potential futures, and negotiating how the expression of potentiality or opportunity relates to the expression of design responses and proposals. In this presentation, Drazin examines some of the implications of this anthropology of future things for social alterity, and how design conceives of the ‘significant others’ on whose behalf it so often works. When Objects Fail: Unconcealing Things in Design Writing and Criticism (historical, late 20th c.) Hall argues in this presentation that one way to put Thing Theory to use in design criticism is by analysing objects that have failed. When something fails, we want to know why, a question that immediately moves design criticism past its obsession with style, form, movements and biographies and into a mode of explication or unfolding. Failed objects expose the decisions, agendas, ingredients, affordances, translations, delegations and histories that were concealed in the glossy photographs, success testimonials and exhibited artefacts that are the currency of contemporary design. ← The Power of Maybes.